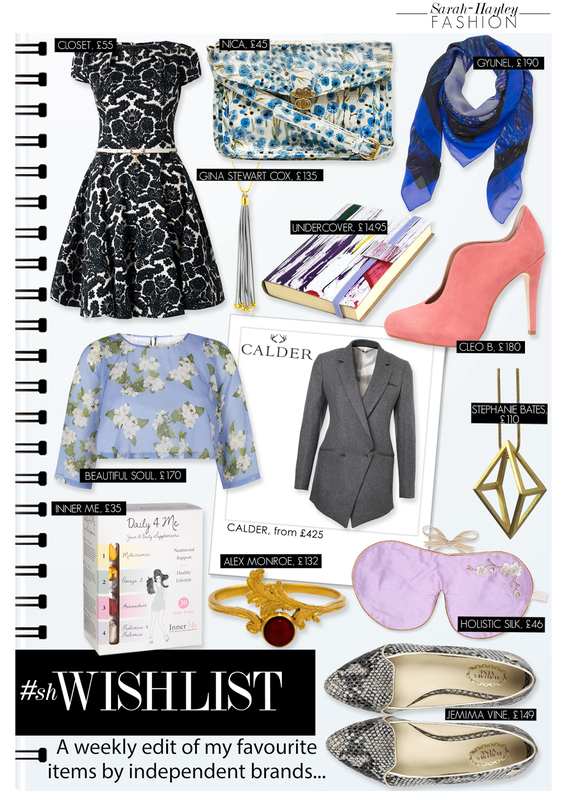 NINE - The #shwishlist - A weekly edit of my favourite items.. I have enjoyed a great week with some exciting projects coming up and I look forward to sharing these with you soon. With the latest dose of beautiful weather I forced myself to leave the office and walk to all of my showroom appointments, to peruse the Autumn/Winter 2014 collections. Take a look at my Instagram feed for a preview of what is in store next season. During my visits it was a great opportunity to discover new brands. One in particular is Nica Handbags. The namesake brand of Nica Kim launched in 2005 whilst she was still studying at the London College of Fashion. Nica won a competition to spend a week with the design team of a handbag specialist and the Nica brand was formed shortly after. Nine years on the brand has dramatically expanded with 400 stockists including well known department stores, such as John Lewis, to independent fashion boutiques. With her penchant for quirky patterns and materials, Nica has established a core style of handbag known for their individuality, practicality and affordability. One brand which I have known for a while is Beautiful Soul. I met Creative Director Nicola Woods at her very first press day. The luxury womenswear line was established from her desire to create beautiful pieces from vintage kimono's, up-cycling and transforming them into a unique tailored garment. In 2011 the Ready-to-Wear line, Beautiful Soul London, began and the pieces are undeniably irresistible. Designed and made in the UK, Beautiful Soul is committed to sustainability, balancing the core style of the brand with ethical principles. Last year the label was shortlisted for the Sustainable City Awards. If you are looking for an outfit for a Summer Wedding or a day at the races, please take a look at the Beautiful Soul collection, with the most beautiful prints these garments need to be seen. My first pair of Cleo B shoes featured the most amazing 'cassette tape' heel. I spent a whole season wearing them to everything and received many compliments. Easy to walk in, incredible to look at totally nostalgic, taking me back to my childhood mixing tapes with friends. The next style on my Cleo B shopping list are these feminine shoe boots, featuring a curvaceous form. Also, Cleo B have now added the insanely cool 'shoe clips' to the collections, enabling you to customise your shoes even further!